By LOU PAVL OVICH, JR.
NASHVILLE, Tenn. — Chicago Cubs’ hitting coach John Mallee is one of the most progressive teachers in the game of baseball. 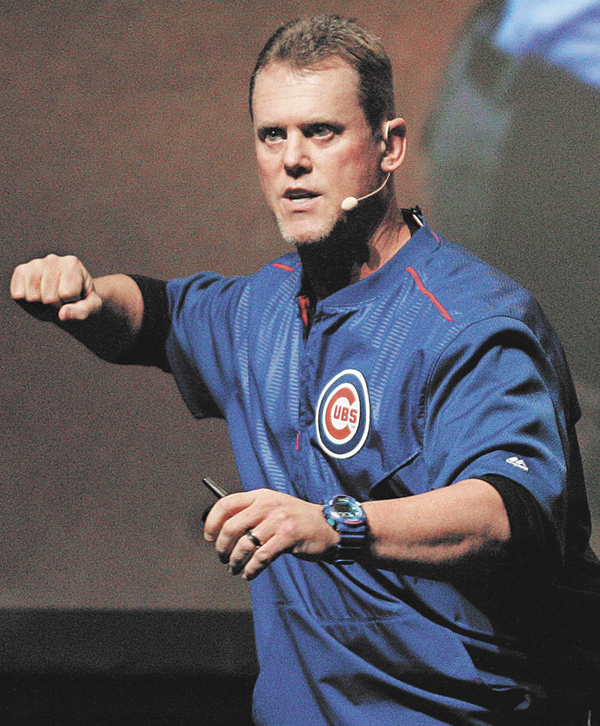 Last January at the American Baseball Coaches Association convention in Nashville, he gave a remarkable presentation on How Science and Analytics Changed The Swing. It was one of the most important talks in the history of the ABCA which dates back to 1945. Mallee is in his second year in the Cubs organization and his sixth as a major league hitting coach. He has 20 seasons of experience in professional baseball on every level. Along the way, he has tried to uncover every possible clue as to what allows a great hitter to excel. The ideal launch angle for balls exiting greater than 90 mph for a base hit is 7-12 degrees (75% hits). The ideal launch angle for balls exiting less than 90 mph for base hit is 12-15 degrees (90% hits). The ideal launch angle for balls exiting greater than 90 mph for a home run is 23-35 degrees (40% home runs). The average exit velocity for a hard-hit ball is 90 mph. The average exit velocity for a home run in 2015 was 103.5 mph. The ideal attack angle for a line drive is 6-14 degrees. The ideal attack angle for a home run is 20-25 degrees. Average speed of a fastball is 92.5 mph. Average distance pitches thrown to the plate is 54′ 4″. Average height of the release point by the pitcher is 6′ 1″. Reaction time for the hitter is .41 seconds. The fastball crosses home plate at a 6 degree decline. The average fastball pitch height arriving at home plate is 2′ 7″. The average fastball crosses the front of home plate at 85.2 mph. Average speed of a major league curveball is 78 mph. The curveball plane is a minimum 10 degree decline. The curveball pitch height as it arrives to home plate is 1′ 11″. A curve crosses the front of home plate at 72.4 mph. The batting average for ground balls is .245. The batting average for line drives is .640. “The story of how I arrived at my hitting philosophy is interesting, said Mallee. “The foundation of what I believe in started in 1996 in Beloit, Wisc. It was my first year coaching in professional baseball, and I was 26 years old. Up until that point, I was teaching lessons and giving information to hitters that I was previously taught as a player. “Then I was introduced to Bob Keyes of Bio-Kinetics Research and Development and Ralph Dickinson who was my hitting coordinator with the Brewers. That was my first experience using science to help me understand how the swing works. “I learned about dynamic balance, controlling the body’s center of mass, the kinetic chain, accelerating and decelerating links, sequential order, muscle torque, along with the pre-stretch that takes place prior to muscle firing. “All of this vividly showed that the lower half of the body starts the swing. The big debate when I was finishing pro ball was whether the hands go first or the lower half. Where does the swing come into play in regard to the kinetic chain? Mallee said that he has become even more informed about hitting the last three years. “Three years ago, I was involved with the Astros’ organization and was introduced to analytics. These are the numbers behind the results. I learned the importance of exit velocity, launch angle, OPS (on-base plus slugging), slugging percentage, trajectory with different types of pitches, spin rate, effective velocity, etc. Mallee said the numbers vividly show balls must be hit in the air and not on the ground. “When you look at batting averages and slugging percentages of balls that are hit on the ground compared to line drives or fly balls in Major League baseball, the numbers are revealing. “When you hit ground balls, the batting average is .245 while the slugging percentage is .266. “The batting average for line drives is .640 while the slugging percentage is 1.030. “The batting average for fly balls is .143 while the slugging percentage is .567. 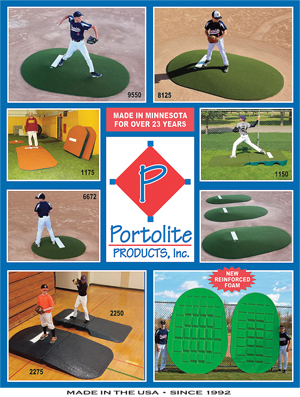 “The numbers show that you should stay away from ground balls and ideally hit line drives. Fly balls are much better to hit than ground balls when you look at the slugging percentage. “Pitchers are all trying to keep the ball low and sink the ball on the strike zone. So with all this data and common sense, a question begs to be answered. Mallee said when you examine launch angles for line drives and home runs, you get a better picture of what hitters must accomplish to be successful. “The ideal launch angle for a home run is between 23-35 degrees which accounts for 40% of all home runs when balls are hit at a 90 mph exit velocity or greater. 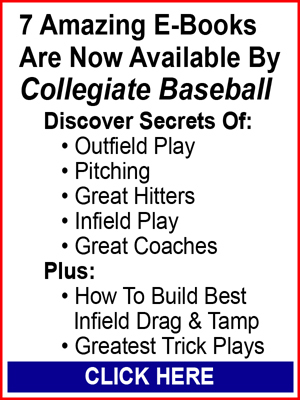 To read more about the hitting philosophy of John Mallee, purchase the April 22, 2016 edition of Collegiate Baseball or subscribe by CLICKING HERE. The rest of the article includes important information such as where the bat makes contact with the ball in regard to ground balls, line drives and home runs. It also delves into the average exit velocity off bats of Major Leaguers, the bat speed at impact, the time to impact, the attack angle of hitters since typical pitches are coming in at a 6 degree decline, how to practice so that you can simulate a 92 mph fastball at a short distance for hitters and at what height it must be thrown from. Plus, Mallee talks about the incredible importance of Result Oriented Training which allows hitters to make adjustments to their swing without a coach picking apart their mechanics as hitters thrive. ANNAPOLIS, Md. — Luke Gillingham is one of the greatest pitchers in U.S. Naval Academy history. • 8-1 record over 83 1/3 innings. • Ranked fourth nationally with a 1.19 ERA. • 111 strikeouts and only 14 walks. 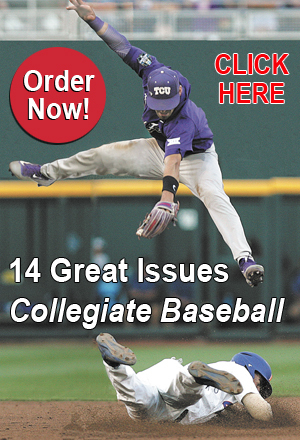 • Led NCAA Division I in both hits per nine inning (4.75) and WHIP (0.70). • Recorded 12 or more strikeouts in four of his first five starts (16, 14, 12, 8, 15). • Fired 5 complete games over 12 appearances. In 2016, Gillingham is having another fine season. He is currently 3-1 with a 2.18 ERA and has struck out 39 batters with only 5 walks and 2 complete games. It’s quite a departure from his first two years at Navy when he posted a combined 6-9 overall record and 3.28 ERA. 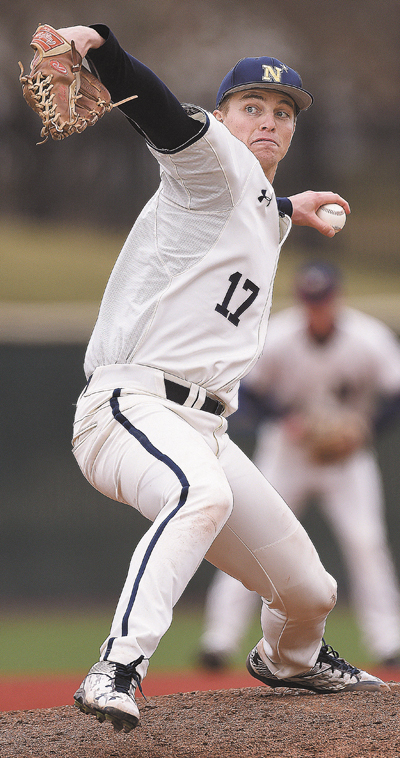 The 6-foot-3, 200-pounder gives a lot of the credit for his recent success to Pitching Coach Bobby Applegate. “Coach Applegate deserves a lot of credit for the successes I had last year and early this season,” said Gillingham. Gillingham said Applegate is big on mentally visualizing pitches prior to throwing them and taking the art of pitching one pitch at a time. In the past season and a half, he has thrown 7 complete games which is a direct result of Applegate’s influence. To read more of this article, purchase the April 8, 2016 edition of Collegiate Baseball or subscribe by CLICKING HERE. MALIBU, Calif. — Pepperdine University’s pitching coach Rolando Garza is utilizing one of the most progressive systems in baseball. Garza collaborated with Korean strength coach/skill developer Youngjin Yoon to create a holistic, hybrid pitching philosophy that merges the American power pitching culture with Southeast Asian baseball developmental strategies. Over three years as the pitching coach at Riverside City College under legendary head coach Dennis Rogers, this system produced 10 MLB draft picks/free agent pitching signees. 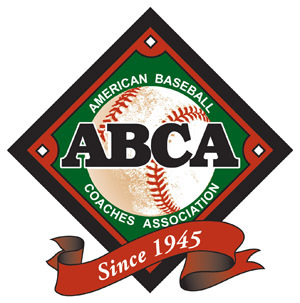 In 2013, the developmental program produced the most pitching draft picks in California at the NCAA Division I, II, III or NAIA levels, with five pitchers selected. Moreover, the pitching staff was second in the state of California with an ERA of 2.08. Garza learned everything he could about the pitching philosophies of Southeast Asian baseball with the help of Yoon and even made two trips to Korea to survey the baseball infrastructure within pitching development. Garza said that Yoon has been a 10-year skill developer/strength coach in Korea for the Lotte Giants Major League team. He is currently finishing up his Ph.D. in exercise science. Prior to this intensive study of the way Southeast Asian pitchers are trained, Garza earned his bachelor’s degree in kinesiology from Cal. St. San Bernardino, graduating in 2010 with honors. Because of this background, his focus is not only to help pitchers improve and become the best they possibly can be. But his system is 100 percent player and health driven. That is why so far, no pitcher he has taught with his full system has undergone any surgery. “I started working at Riverside City College in 2011 and began working with Youngjin Yoon from Korea at that time as well,” said Garza. Garza said it turned into a 4-year odyssey on pitching development merging the American and Korean systems of pitching instruction and development. “We worked together the first year. Just before our season started at Riverside, we went to Korea together. He took me along to research for about a month the whole baseball infrastructure from Korean Little League to high school, college, minor leagues, independent leagues and Major League. “It was fascinating looking at all of their developmental models. When I saw the pitching development aspect and their fine attention to detail, I was blown away. We finished the trip and came back. He was a sponge with the information I gave him as well since I had been in the American minor leagues for 10 years. He wanted to know all about power pitching. He explained to me that there are many different ways you can train within power pitching development. Proprioception is the ability of the body to determine where every part is positioned at any given time. It is almost like the athlete has a subconscious internal computer complementing his conscious effort to stabilize everything whether you are moving or standing still. This internal mechanism triggers muscles to contract and relax to fit the situation. Proprioception helps athletes perform better in sports and also avoid injuries. “In the context of what we were doing, it is fine muscle movements training to help repeat the delivery,” said Garza. “We call them pitching functional movements. For example, working on your balance position and holding it for 15-20 seconds or holding the extension or release point in the delivery for 15-20 seconds. We also have different range of motion drills to create stability and repeatability in the delivery. The end goal would be to throw more strikes. “Our pitchers also do a lot of work on balance beams to help with pitch direction. We also use the beams for body control, keeping their head on line and holding different pitching functional movements throughout the delivery. The purpose of the balance beam creates a foundation of direction and enhances body control throughout the delivery. We hit a lot of pitching functional movements from a mechanical standpoint on the beam. “Pitchers learn how to center their body and keep moving in space so they learn a repeatable delivery that is efficient pitch to pitch. How many pitchers do you see out there who fly open and step off target from home plate or throw with a closed front side? They are all over the place. The balance beam helps tremendously with these issues. “Our balance beams are about 12 feet long, 10-12 inches wide and about eight inches off the ground. We have had our balance beams fabricated with aluminum so they will last a long time. They are powder coated so they won’t rust and are light enough they can be moved easily. “Some beams that are out there are a bit too small in width for me where it causes the pitcher to fall off easily. Ours is wide enough that the pitcher can control his body on it. Yet if he opens up too quickly and steps too far to the side or is too closed and doesn’t step toward the target, he will fall off. “When pitchers are on the beam, they utilize dynamic pitching movements where they move properly through space without throwing balls. Once they feel proper movements they should have in their mechanics, they can duplicate it in bullpens and in games. The rest of the article delves into symmetrical training, flexibility, quick twitch and explosion, mind and body along with training focus and clarity as strike percentages increase. Plus, he explains how this unique hybrid system utilizing the best of USA and Southeast Asian development programs keep pitchers healthy. SAN DIEGO, Calif. — One of the greatest high school baseball coaches in history is Sammy Blalock, skipper at Rancho Bernardo High School (San Diego, Calif.). Blalock recently picked up his 900th career victory when the Broncos beat Eastlake, 13-2 during the 66th annual Lions Tournament in San Diego. His overall record in 41 years of coaching on the high school level is 900-321. Only two other high school baseball coaches in California history have surpassed 900 wins – El Segundo’s John Stephenson (1,059) and Rancho Cordova’s Guy Anderson (927). Nationally, 26 coaches have reached the 900 win plateau. Blalock started his coaching career in 1975 at Mount Carmel High School where he won 300 games, nine league titles and four San Diego section championships. 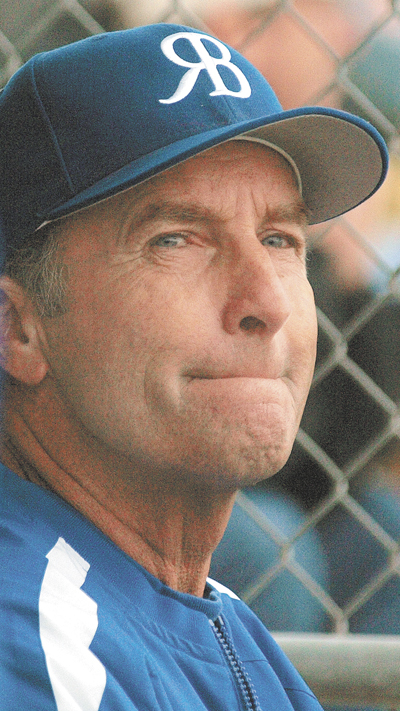 He left in 1990 to coach at Rancho Bernardo where he has led teams to 22 league titles and 12 section championships. He has sent numerous players to professional baseball, including first-round draft picks Billy Beane, Cole Hamels, Danny Putnam, Allan Dykstra, John Drennen, Matt Wheatland, Scott Heard, Jamie Jones, and Alex Jackson. Blalock gave a succinct answer as to why he has been such a successful coach for so many years. “We have 5 simple steps to having a successful baseball season,” said Blalock. “First, always do your best, no more and no less. Keep in mind that your best will never be the same from one moment to the next. Regardless of the quality, keep doing your best. “Second, embrace failure because no excuses are needed. Failure is a big part of baseball, so learn to deal with it. Part of being your best is accepting your mistakes and learning from them. Fear not failure. Have awareness, learn from your mistakes and move on. Excuses after failures only delay your learning. “Third, focus (mental toughness). Focus on things you can control. Control of emotions allows for control of behavior. Practice like you perform. Perform like you practice. We try to focus in on today. Somebody asked me about my career. I responded that all a career embodies is a bunch of days. Have a good day today and work on what you need to do today, and your career will be an accumulation of many good days. Blalock gave a vivid example concerning pitcher pickoff plays. “If a pitcher is on the field working on reading pickoff signs and executing a pickoff play, all of our other pitchers are on the side watching and simulating in their heads what they need to do. While one player is utilizing his thought process and physical skills, every other pitcher is doing that in their minds. Blalock said the fourth major area is the team. “We want kids to focus on our team and not what the other team does. I have seen that happen way too often when teams get wrapped up with what other teams are doing. So we want to focus on our team. “Treat others the way you want to be treated is also important. Together everyone achieves more. It’s always we before me. Concentrate on our team, not the opposition. The outcome of the game is firmly in our hands, not in the other team’s. To read more of this in-depth story, purchase the April 22, 2016 edition of Collegiate Baseball or subscribe by CLICKING HERE. Blalock also delves into the offense of philosophy of Rancho Bernardo which features an aggressive approach with little bunting, how his players develop skills during a precise organizational program throughout the year, his unique training session that teaches players how to play the game offensively and defensively and how everyone can contribute by maximizing their best skills. Plus, Blalock explains why getting the front foot down early prior to hitting a pitch may not be the best approach, how the knob of the bat and back knee work together, and finding one or two simple hitting adjustments that will help each offense player. An extremely talented surfer, he also talks about his run-in with a crocodile in Costa Rica.